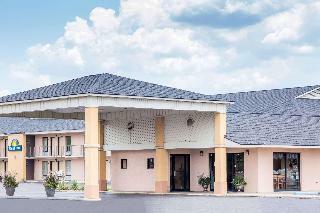 This lovely hotel is located in Aiken. A total of 42 bedrooms are available for guests' convenience. Internet access is offered to make guests' stay even more enjoyable. The premises offer accessible public areas. This is not a pet-friendly property. The car park may be useful to those arriving by car. This comfortable hotel is in Aiken. A total of 76 units are available for guests' convenience. Guests can enjoy access to the internet to stay connected to work or home. Common areas are suitable for wheelchair-disabled people. Pets are not permitted on the premises. Guests may take advantage of the car park. Conference facilities are included at this hotel. 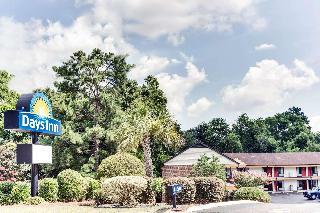 This affordable, accommodating and convenient hotel is the ideal home from home for travellers visiting the Aiken area whether for business or pleasure. It is ideally located just minutes from the University of South Carolina Aiken, Hopeland Gardens and the Aiken Thoroughbred Racing Hall of Fame and Museum. Historic Downtown Aiken with its many attractions is just a few minutes away. 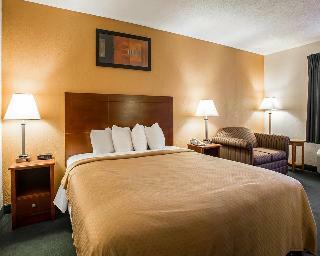 The well-appointed guest rooms all feature a refrigerator, microwave, iron, ironing board, hairdryer and coffee maker. Select rooms contain work desks. Corporate travellers will appreciate the business centre with access to copy and fax facilities and the ample free parking. The generous selection of amenities include a free deluxe continental breakfast, free high-speed Internet access, a free weekday newspaper, free coffee and free local calls as well as a seasonal pool. Visitors can experience southern charm and history in this affordable South Carolina establishment. 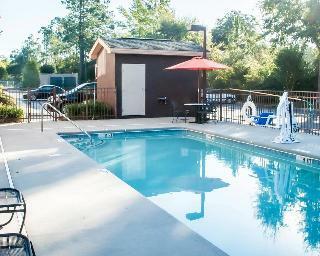 It is conveniently located in downtown Aiken, just minutes away from many nearby attractions. Guests might choose to take a walk in the famous Hitchcock Woods or stroll around the Hopeland Gardens. Those who love horses can explore Aiken's equestrian community or visit the Thoroughbred Racing Hall of Fame. Additionally, the City of Augusta, Georgia is only a short drive away. Guests on business may host an event in the hotel's business room, which can accommodate up to 19 people. 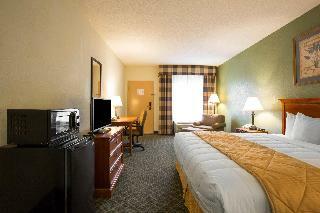 All guest rooms have cable television and some are equipped with refrigerators and microwaves. The hotel features a seasonal outdoor pool and an exercise room, and offers free breakfast, free wireless high-speed Internet access and daily newspaper (except weekends). This establishment is pet friendly. This hotel situated in the centre of Thoroughbred Country is ideal for horse lovers who will find plenty of stables for equestrian activities. Also in the Aiken area are many places of interest such as historic churches like St. Mary Help of Christians, museums, malls and wineries, where tours and tasting are offered. Nearby Augusta also has its fair share of churches worth visiting and also boasts the Augusta National Golf Club, home to the Master's Tournament. Facilities available at the hotel include free parking, free daily paper, seasonal outdoor pool and free access to a nearby gym. The complimentary Morning Melody Hot Breakfast is a definite must. The attractively designed rooms are all smoke free and offer cable television with free movie channels, refrigerator, microwaves, coffee maker, iron with board and hairdryer. Business or pleasure this is a great place to stay. Offering value-for-money accommodation and friendly service, this hotel is situated near US Highway 1 within easy reach of many of the area's attractions, and is an ideal option for both business and leisure travellers. Aiken State Park, with a river swamp and forest land, is home to a wide variety of flora and fauna, guaranteeing a great day out. Historic Aiken town centre is another must for visitors, offering many shops, restaurants and art galleries. The hotel is close to several eateries, and guests can enjoy a delicious continental breakfast on site, as well as complimentary coffee throughout the day. The comfortable rooms all include a microwave, coffee maker and hairdryer, and some also feature a whirlpool bath tub and desk. This eco-friendly establishment also provides WiFi Internet access and business services, as well as ample parking space.